Kings Point consists of 114 condominium and homeowner associations ranging in size from 14 to 170 homes. Each Association has its own bylaws, rules and budgeted fees. All Associations are Members of the SCCW Master Association and most elect to belong to the Federation of Kings Point. Sun City Center West Master Association owns the common property of Kings Point and maintains the roads, sidewalks and landscaping along the main streets in Kings Point. All communities within Kings Point are members of the Master Association and we all share in the cost to maintain these shared properties through maintenance and reserve fees. There are no CDD fees. The Federation of Kings Point manages the recreational amenities on behalf of all residents. It also negotiates bulk contracts for their member associations for cable, landscape, pest control, insurance, waste management, and property management. These services help keep costs down for home owners in associations who are members of the Federation. FirstService Residential is the property management company responsible for providing professional management services to the Federation and the Associations, including operations support, accounting, etc. within the terms of their management agreement. The Kings Point Sun City Center West Land Trust (The Trust) holds title to the recreational facilities properties on behalf of all 114 Kings Point Associations as Beneficiaries of the Trust. The Federation Board is the governing body with responsibility to oversee the management of The Trust, in accordance with the Kings Point Sun City Center West Land Trust Agreement and Loan Agreement. Vesta Property Services is the facilities management company responsible for professionally managing the recreational facilities, transportation, and security at the direction of the Federation Board of Directors and within the terms of their management agreement, the Land Trust, and the Loan Agreement. The Condominium Owners’ Association and the Kings Point Warranty Service Association provide important services to the owners and residents of Kings Point. They have no governance authority and participation in these organizations is voluntary. Condominium Owners’ Association (COA) is the oldest continuing organization within Kings Point. It is managed by a board of directors and operated by resident volunteers who provide a variety of services to the Kings Point Community, including Sun City Center Telephone Directory listings, free notary, fax machine service, blood pressure screening, wheelchairs and walkers, free transportation via Hart-Line bus to Brandon, etc. They also sponsor the Kings Point Library, copy machines and bulletin boards for resident use in both clubhouses. 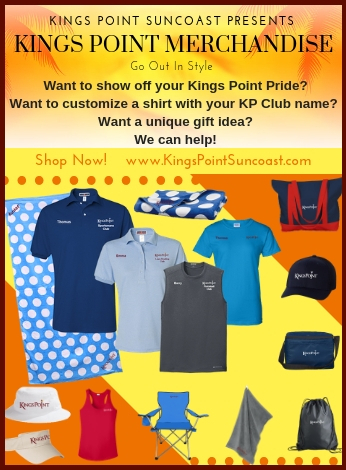 Kings Point Warranty Service Association, Inc. (KPW) K.P.W. Service Association, Inc. is a non-profit association that provides warranty services for appliances, i.e. air conditioners, stoves, refrigerators, etc. to unit owners who choose to join by purchasing service contracts. KPW has provided service in Kings Point since 1980. A Board of Directors is elected by the KPW members to establish the annual rates, contract terms and to employ the contractor that provides the service. Kings Point West Recreation Facility Rules Association, Inc. (KPWRFRA) – better known as the “rules company” is the not-for-profit corporation that develops rules and regulations concerning the use of the Recreational Facilities. This organization gives Unit Owners, through their Association Presidents, input in the establishment of reasonable, proper and necessary rules and regulations pertaining to Kings Point Facilities, i.e. identification badges, pool, whirlpool and sauna use, etc. for the mutual benefit of all concerned. Each Association in Kings Point is a member of the KPWRFRA.